LEGO style is simple and yet so admiring to look. If you love LEGO plastic characters, here is chance to get involved in online LEGO style avatar making. 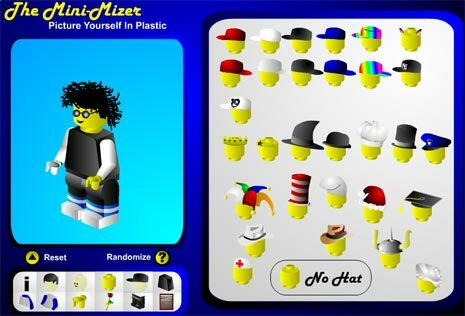 The Mini Mizer is a flash based online tool to create custom colorful LEGO style avatars in few mouse clicks. Related – Free Avatars directory, download & use ! You can customize each and every part of the plastic looking LEGO character. For example, to customize hair style click on head icon at bottom left and various hair style options will appear in the right window. You can click any of the hair style look and render it to your LEGO avatar icon. Similarly, you can customize other parts of your LEGO character. After you are done with play-around with different colors and style you can save the avatar. This is tricky part as there is no direct button to save your creations. You need to hit Print Scrn button, then open Microsoft Paint, paste the screenshot, cut the lego avatar and finally save it. Checkout the Mini Mizer LEGO avatar maker and here are instructions to save your avatars. Free Avatars directory, download & use ! Yea I love this service :D It’s plain easy..